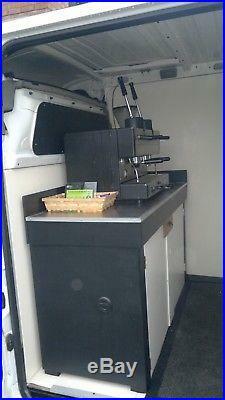 A well used La San Marco Leva 85 Dual Fuel espresso machine + all associated equipment. A genuine retirement sale - this has been my business for the past 11+ years, everything still in use every day, and will be until early in the new year. For sale is a simple but effective, self-contained set up comprising of the espresso machine mounted on a very substantial work station which houses the water container/ waste container, external supply pump, battery, inverter, complete with all plumbing etc.. It is fitted in a Renault Master at present, but would be straightforward to install into a similar vehicle as it simply fixes to the floor / bulkhead, - ideally these need to have good quality ply attached to them first (many vans will already have this). I have always used lpg & have never tried the electric function as I didn't want the noise of a generator, but I guess this could be an (untested) option, please note that the gas fittings are included, but there is NO gas cylinder in the sale. Also included will be the Mazzer Grinder, fold up handwash baisin, battery charger + anything else relevant I can find, a load of machine spare parts / consumables etc. I'll even leave you some cash in the till for a float! Obviously this will be for collection only, & although I will gladly show you how everything goes & demonstrate it working, I don't want to get involved in fixing it into your vehicle - sorry! To the right person with the necessary motivation, this unit should prove to be an ideal & relatively low cost business start up. Please keep any questions sensible & I will try to answer them! Have been asked if I will sell everything, the van included, & if so, how much. The item "Coffee Van Equipment / Dual Fuel Lever Espresso Machine" is in sale since Thursday, December 27, 2018. 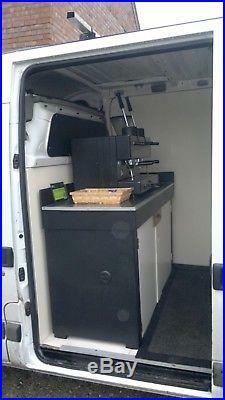 This item is in the category "Business, Office & Industrial\Restaurant & Food Service\Catering Trailers". The seller is "caravanmis-shapes" and is located in Dereham. This item can't be shipped, the buyer must pick up the item.